Remind Me Again, Why Isn't Pluto a Planet? In light of the discovery of a fourth moon orbiting Pluto, Mark Thompson ponders what it takes to be called a "planet." Last week, news broke that a team of astronomers using the Hubble Space Telescope had discovered a new moon in orbit around Pluto. They were actually looking for signs of a ring system when they stumbled across another tiny object -- now imaginatively called "P4" -- bringing Pluto's moon count to four. This is quite a nice little news story in its own right, and covered by my Discovery News colleague Irene Klotz. However, what I hadn't anticipated was a deluge of messages asking me if this means Pluto is now a planet again. Well, the answer is a resounding no. It is still, and always will be, a dwarf planet. But what rules have we applied to Pluto to forever condemn it to the back seats of the solar system rankings? Before we look at the well established rules of planetary terminology, it's worth remembering why we even need such a definition. Like many of you, I was taught as a school kid that there were nine planets in the solar system: Mercury, Venus, Earth, Mars, Jupiter, Saturn, Uranus, Neptune and Pluto along with thousands and thousands of tiny objects called asteroids. For a long time, Pluto was believed to larger than Mercury but after the discovery of Charon (Pluto's largest moon) in 1978, the foundations of its planetary status started to wobble. By studying Charon, astronomers could accurately determine the mass of Pluto and surprisingly found it to be much smaller than Mercury and even our own moon. During the late 20th century, more objects started to be discovered at comparable distances to Pluto's orbit and beyond; one of which, Eris, was even thought to be larger than the ninth planet in our solar system. Eris was discovered by Mike Brown and his Palomar Observatory-based team in 2005. These discoveries led the International Astronomical Union (IAU) to setup a committee in 2005 to consider an official definition of a planet. There were a number of different definitions that were considered, but in 2006 a final, all-encompassing set of criteria was identified that, once and for all, knocked Pluto off its planetary pedestal. 1) be in orbit around the sun. Clearly, Pluto is in orbit around the sun, but so do thousands of asteroids. As far as this criterion is concerned, Pluto is still hanging on by the skin of its teeth. 2) have sufficient mass to assume hydrostatic equilibrium. This is just a posh way to say it is pretty much spherical in shape. Note the careful use of the phrase 'pretty much'; no planet is a perfect sphere. Due to their rotation, often they are a little squashed along the polar axis. This criterion is just saying they that they must have sufficient gravity to have overcome other forces and mould a more-or-less sphere-shaped body. Pluto maintains hydrostatic equilibrium, whereas many of the asteroids and other minor planets are quite oddly shaped. 3) have cleared the neighborhood around its orbit. BOOM! That's the nail in the coffin for Pluto. This final criterion requires that it must have cleared its orbit of all other objects of comparable size, other than its own satellites. This means "a planet" must be gravitationally dominant in its orbit and this is where Pluto fails. Pluto not only shares its orbit with a number of other Kuiper Belt objects, but it also flies inside the orbit of ice giant Neptune! The small print here says that if it fails on this point alone, then it must be classified as a dwarf planet. And so the case against Pluto finally got laid to rest in 2006 when the IAU voted to "demote" Pluto to the status of dwarf planet. The recent discovery of another moon in orbit around the tiny distant world doesn't change anything, sadly. I think in the hearts of thousands of people, Pluto will still always be the ninth planet in our solar system; we just won't talk about it (much). Trouble is that this rule was made up solely to kick Pluto out of planetary status to please certain IAU members. I Vote Pluto to be a Planet in good standing along with other planets discovered recently. Maybe we should just call a planet, a planet, when it has some kind of life on it. Some how i just don't quite get along with calling uninhabitable rocks and gas balls, planets. So that would make earth the ONLY planet in this solar system. Simple enough? Beyond wrote: Maybe we should just call a planet, a planet, when it has some kind of life on it. Some how i just don't quite get along with calling uninhabitable rocks and gas balls, planets. So that would make earth the ONLY planet in this solar system. Simple enough? orin wrote: And what if life was seeded by comets? I don't know how much power New Horizons has to use up; but, wouldn't it be nice if it would take a picture of Pluto once a month so we could watch from way out till it approached Pluto and it's moons! Just one month before Pluto flyby New Horizons will still be ~15,600 Pluto diameters (~36 million kilometers) away. We didn't get a good view of Vesta from the Dawn spacecraft until it was only ~2300 Vesta diameters away. What will Pluto look like! Here is an artists picture. Given a maximum Surface temperature of just 55K it looks a tad warm. This month marks a warm up spell for the New Horizons spacecraft currently on its way to Pluto. Launched January 19th 2006, this mission is now covering a million kilometres a day as it heads to the Pluto system for a rendezvous in July 2015. Last edited by owlice on Fri Jan 20, 2012 12:42 pm, edited 1 time in total. <<The Half Way to Hell Club was an exclusive club organized by the men who fell from the Golden Gate Bridge in 1936 and 1937 and were saved by the safety nets [i.e., blankets]. Iron Worker Al Zampa (1905–2000), as one of the club's first members and the last surviving member, became the unofficial spokesman for the club. 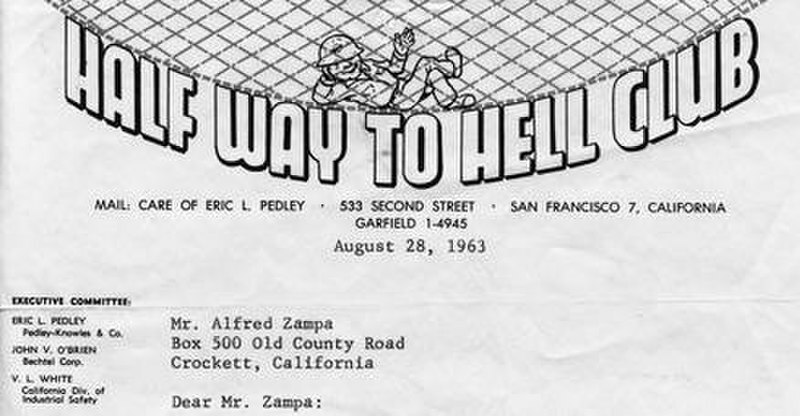 According to Zampa when a man fell to his death from a bridge it was said "he's gone to hell." The men who fell and were saved by the nets were said to have fallen only "half way to hell." Zampa goes on: "There were ten of us that fell into the nets those first few weeks. Four got hurt. I was one of them. We were in the hospital together. We formed the club right there in St. Luke's Hospital." You can help by signing the petition urging the post office’s Citizen Stamp Advisory Committee to recommend a New Horizons stamp to the postmaster general. Tell your family members, Facebook friends and Twitter followers to sign as well! bystander wrote: Plans for the flyby are well under way – and now, so is an effort to petition the U.S. Postal Service to commemorate the historic achievements of New Horizons on a stamp. The mission team launches that petition today, in early 2012, and plans to submit the petitioners’ names and a formal proposal to the U.S. post office knowing it often takes three years or longer for a proposal to result in an actual stamp. I hope they can approve a concept stamp but still allow it to change. In the final stamp, Pluto and Charon should be shown as they actually appear, not so much of the "artist concept" view. Because always, without exception, these images look instantly dated once we have real, high resolution imagery. Today 2/12/12 New Horizons is less than 10 au from Pluto encounter. On Feb. 10, NASA's Pluto-bound New Horizons probe entered the homestretch of its mission. Though the spacecraft is still three years away from its Plutonian close encounter, mission scientists call this the Late Cruise phase of the flight. At the spacecraft’s present distance, much of the solar system fits within a panoramic field of view. The sun is reduced to a bright dot seen against the backdrop of constellations, midway between Gemini and Orion. The sun is glowing at one four-hundredth its brightness as seen from Earth. The inner planets are clustered near the sun within an angular diameter equivalent to eight moon diameters. Jupiter appears as a bright star 10 degrees to the west of the sun. Saturn looks like another bright star 25 degrees to the east of the sun. In less than 1200 days New Horizons will be in Pluto's vicinity! less than 3.29 years. I wish it were tomorrow! orin stepanek wrote: In less than 1200 days New Horizons will be in Pluto's vicinity! less than 3.29 years. I wish it were tomorrow! Time wise New Horizons has now completed 2/3's of it's journey to rondevu with Pluto! What is the speed now?